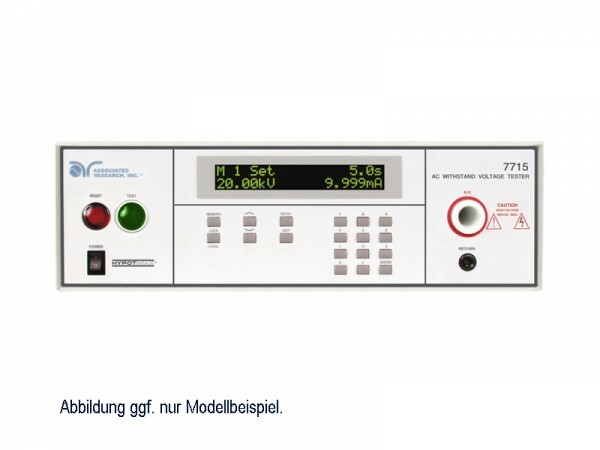 Produktinformationen "AR: HypotMAX (7705) AC Hipot Tester"
The HypotMAX series is a family of high voltage and high current electrical safety compliance analyzers. The 7705 is a 10 kVAC Hipot tester, the 7710 is a 12 kVDC Hipot tester, the 7715 is a 20 kVAC Hipot tester and the 7720 is a 20 KkVDC Hipot tester. These testers will output higher AC or DC voltages for cable, wire, harness and electrical component testing. These bench top testers are easy to use and designed with advanced features such as our patented SmartGFI® safety circuit and our exclusive CHARGE-LO and RAMP-HI systems. With both IEEE-488(GPIB) and RS-232 interfaces these testers can also be used in an automated test environment. The 7705 is a 10 kV AC Hipot tester that is designed to provide high AC output voltage for cable, wire, harness and electrical component testing. This easy-to-use bench top tester offers numerous features for safe and efficient testing, including our patented SmartGFI® safety circuit. In addition, the 7705 can also be used in tandem with our Autoware® control software. Weiterführende Links zu "AR: HypotMAX (7705) AC Hipot Tester"